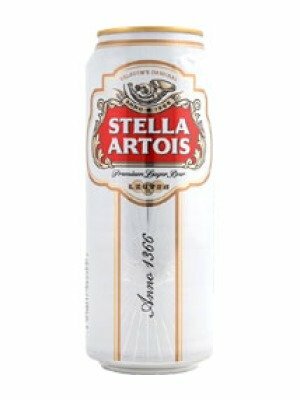 Stella Artois Lager Can is a popular Lager available from DrinkSupermarket.com in 50cl to buy online. Visit DrinkSupermarket.com for the best price for 50cl of Stella Artois Lager Can or compare prices on our other Lager products. Stella Artois is renowned as a quality beer brewed for an average of 6-11 days longer than most other beers using the finest quality hops and barley including Bohemian Saas hops. It is these Saas hops that give Stella its distinctive full flavour. The perfect pint of Stella should be served at 6-8 degrees centigrade to ensure the full flavour of the beer. Now 5% ABV. Brewed in the UK under license. Where to buy Stella Artois Lager Can ? Stella Artois Lager Can Supermarkets & Stockists. You can buy Stella Artois Lager Can online in most retailers and find it in the Lager aisle in supermarkets but we found the best deals online for Stella Artois Lager Can in DrinkSupermarket.com, TheDrinkShop, and others. Compare the current price of Stella Artois Lager Can in 50cl size in the table of offers below. Simply click on the button to order Stella Artois Lager Can online now.